This tutorial will tell how to extend disk volume when Disk Management failed to help resize the hard disk on Windows 2012. Download IM-Magic Partition Resizer Server to extend disk volume (system partition or data partition) on Windows Server 2012. Disk Management on Windows 2012 enables users to extend and shrink disk volume, but it has some limitations. When you are unable to extend disk volume under Disk Management but the partition is running out of disk space on Windows 2012, you can use IM-Magic Partition Resizer Server. It is a Windows Server partition management tool, which is available in partition resizing when any of partitions is running on low disk space. Generally speaking, you can resize system partition and data volume by using this partition software. Download, install and run iCare Data Recovery Software. Right click a partition that has enough free space and choose "Resize/Move" option. You need to move the unallocated space close to the partition that runs on low disk space. 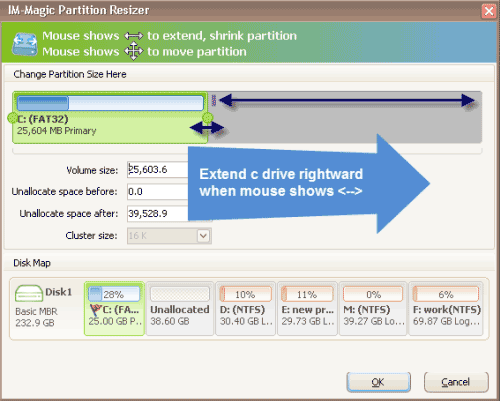 Right click this partition and select "Resize/Move" option. Move the arrows to add the unallocated space to the partition that runs out of disk space and choose "Apply" button. "The D drive is nearly full and I can no longer save any more data to this partition. All files stored on this partition are important to me, so I cannot delete any of them. The problem is that I do not have any other storage device to backup data on the D drive. 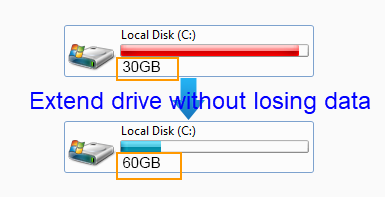 I want to know if it is possible to increase the size of D drive by moving some free space from system partition. Will it have any influence if I move any free space from system partition? Thanks for any kind help!" "Hello! Can anybody tell me the solution for C drive resizing on Windows Server. My PC runs under Windows Server 2012 operating system and it reports low disk space warning on C drive. I tried to perform disk cleanup to free up disk space but the problem still exists. Is there any other way to free up disk space on C drive so that I can fix the low disk space problem on Windows Server 2012?" Users usually feel quite upset when system partition is running out of disk space because it may have influence on the performance of your computer. If you run into the similar problem that system partition runs on low disk space, you can use IM-Magic Partition Resizer Server to resize the hard disk to fix the issue. This partition software allows you to increase the size of system partition by moving free space from any of partitions on the same hard disk. By using this partition software, you are able to extend system partition without reinstalling system or having any influence on the operating system. This partition software provides an easy and safe method to resize system partition on Windows Server 2012. IM-Magic Partition Resizer Server is also available when data volume runs on low disk space. Usually, you can simply delete or move files to free up disk space when a data volume is running out of disk space. However, if you do not want to delete or move any file, you can also use the partition software to increase the size of data partition to fix the low disk space problem. By using this partition software, you can expand NTFS or FAT32 partition without touching any information on the disk. How Does Disk Management Work to Resize Hard Disk? You can resize hard disk under Disk Management on Windows Server 2012. It works similarly as partition software, but it has some limitations. First of all, you need to open Disk Management and select a partition that has much free space. Then, you can right click this partition and choose "Shrink Volume" option to create some unallocated space. Thirdly, you need to move the unallocated space close to the partition you want to extend. The problem is that Disk Management cannot help move partition, so you need to delete all partitions between the unallocated space and the partition that runs out of disk space. Finally, you can right click the partition that runs out of disk space and select "Extend Volume" to add the unallocated space to the selected partition. Deleting partition will erase everything on the partition, so you should backup important data before deleting any partition.